Deep Learning – What Exactly Is Depth of Knowledge? Deep Learning – Depth of knowledge. It’s a concept we in education have heard a lot about since our states transitioned to college and career ready standards. It’s also one of the most misinterpreted and misrepresented concepts in education that is not only confusing but also frustrating us educators. Most of it is due to the DOK Wheel. Educators can use to plan and provide teaching and learning – for higher order thinking. It categorizes the levels of thinking students are expected to demonstrate, which is what cognitive taxonomies such as Anderson and Krathwohl’s revision of Bloom’s Taxonomy, Cognitive and Metacognitive Systems of Marzano’s New Taxonomy, and Biggs and Collis’s SOLO Taxonomy. 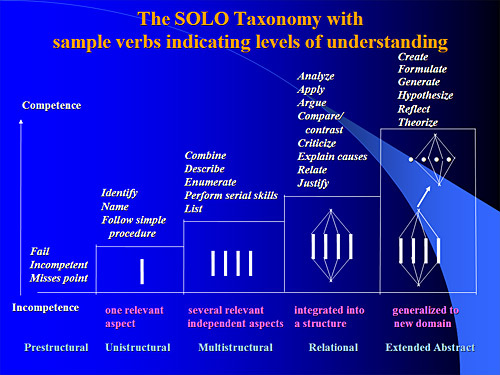 In fact, out of all the taxonomies that categorize higher order thinking, the DOK Wheel is most aligned to the SOLO Taxonomy and its four quadrants. This should be called the HOT Wheel or even the SOLO Wheel and could be used to plan and provide instruction that marks and measures higher order thinking. 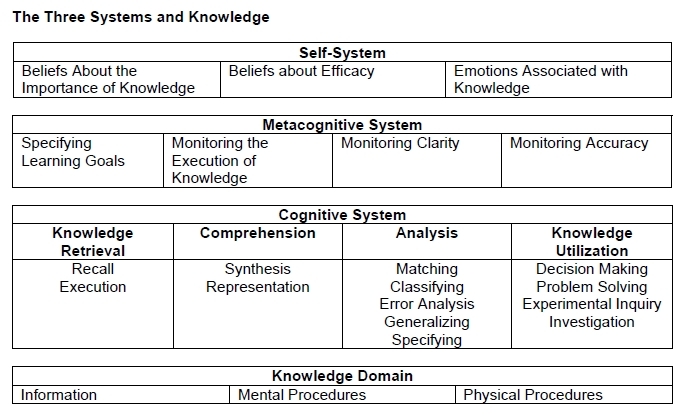 However, it does not designate the depth of knowledge students are expected to communicate – or, at least, how Webb’s Depth of Knowledge Model designates these levels. The concept of depth of knowledge that is addressed in the college and career ready standards was developed by Norman Webb (1997; 2002). Webb designed his model as a means of increasing the cognitive complexity and demand of standardized assessments. Traditionally, standardized assessments measured students to think deeply about the academic content, concepts, ideas, and procedures they were learning. However, these assessments were limited in measuring students ability to transfer and use what they were learning in different contexts. They were also limited in measuring the depth of understanding students must develop and demonstrate. Students were challenged to demonstrate – or show – the ability to think deeply about how to answer questions, address problems, accomplish tasks, and analyze texts and topics. However, they were not being challenged to communicate – or tell – how and why they could transfer and use what they were learning in different contexts.